On Sept. 8, 2014, Patrick Flaherty ’92 was on the twice-weekly Brussels Airlines flight to Monrovia, the capital of Liberia. As he looked around, he found himself virtually alone. The plane was eerily empty. By then, few wanted to fly into Liberia. It was the epicenter of the raging and deadly Ebola outbreak, crippling West Africa. Just weeks before, journalists reported frightening post-apocalyptic scenes of bodies lying in the streets and empty grocery shelves. Schools were closed, and Liberians were told to stay home and off the streets at night. The virus had infected more than 3,000 people in Guinea, Sierra Leone, Liberia and Nigeria, and had killed more than 1,500, according to the World Health Organization (WHO). Estimates were that more than 10,000 people a week could be infected with Ebola unless more was done to stop the outbreak. Flaherty wasn’t afraid. As an employee of the United States’ public health agency, the Centers for Disease Control and Prevention (CDC), he had readily volunteered to help fight the epidemic. Flaherty is based in Bangkok, Thailand, where he works full time as deputy director of a human immunodeficiency virus (HIV) and sexually transmitted disease prevention research program. To fill positions in West Africa, the CDC asked its staff all over the world to temporarily fill jobs in Liberia, Sierra Leone and Guinea. He went to Liberia for a five-week stay, serving as a public health advisor. “It was a unique challenge and opportunity,” he said. In his position, Flaherty coordinated local and international efforts to help Liberians end the epidemic. He worked with the Liberian government, local community and health leaders, U.S. government agencies and international nonprofit organizations to help the country’s Ebola victims get treatment. He also kept track of all the activity to target aid where it was needed and bolstered ongoing education and Ebola prevention strategies by enhancing communication between groups. Patrick Flaherty ’92 found his plane almost empty as he flew to Liberia in September to serve as a public health advisor during the Ebola outbreak. “I was glad I went, but I wish I could have left after the epidemic had ended,” said Flaherty, who departed from Liberia on Oct. 13. In mid-December there were more than 7,700 cases of Ebola in Liberia according to the World Health Organization (WHO), but the number of new cases had decreased and at the national level the country had the capacity to isolate and treat all reported cases. Flaherty’s route to Liberia began on the campus of William & Mary even before he was a college student. Flaherty grew up in the suburbs of Washington, D.C., where politics and policy were just part of the landscape. He and his younger sister, Erin ’93, could jump on the Metro, visit a Smithsonian museum and see the White House for an afternoon. Everyone in their neighborhood got a copy of the Washington Post at their doorstep. Often his family would drive down to Williamsburg for the day. Flaherty’s mother, a second-grade teacher, loved to immerse her children in history. During high school, Flaherty developed an interest in international politics and decided to join Model United Nations, an academic competition that promotes diplomacy and international relations. For three consecutive years, he attended a weekend-long Model UN forum on William & Mary’s campus. He learned about global politics and policy, and got a taste of student life. He liked that W&M’s small size encouraged a sense of community and that the school had a rigorous international relations program, then symbolized by the ongoing construction of the Reves Center for International Studies. He decided to apply early admission and was accepted in December 1987. “I didn’t want to go anywhere else,” he said. Flaherty’s advisor and mentor freshman year was former Hispanic studies chairman and professor Howard Fraser. Fraser, who passed away in 1998, taught Portuguese and Spanish and oversaw the interdisciplinary curriculum, then called Latin American studies. The program drew from anthropology, economics, government, history, international relations and modern languages. Fraser’s energetic and good-natured teaching style encouraged Flaherty to consider Latin American studies, in addition to economics as a major. Sophomore year, Flaherty was a resident advisor in Yates Hall. He became good friends with a student who had recently returned from a public health project in Ecuador through Amigos de las Americas. The Houston-based nonprofit sponsors leadership projects in nine Latin American countries and teaches young people about how to be catalysts for social change. Flaherty was intrigued. He decided to apply to Amigos and was sent to Brazil the summer between his sophomore and junior year. He lived with a family in rural Brazil and worked on public health projects, like building latrines and educating the local community on the importance of hand washing and proper hygiene. He loved the experience so much, he spent the following summer in Ecuador. Then he spent another summer in Brazil and after college, a summer in Mexico — all through Amigos de las Americas. 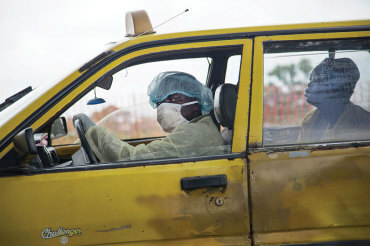 Sept. 3, 2014, Monrovia, Liberia: A taxi driver brings a sick woman to an Ebola clinic. William & Mary prepared Flaherty for his future by providing “lots of opportunities for volunteering and community service, and if you have that in your nature, there are lots of angles to fit in,” said his sister Erin, now an Army obstetrician and gynecologist at Fort Stewart in Georgia. She added that the “expectation of excellence from peers and professors” also helps William & Mary students to become leaders. “I always thought Patrick would go into politics or business economics because he was good at numbers, but I think it was those summers he spent volunteering in Latin America that swayed him into public health,” she said. After graduation, Flaherty pursued a master’s in public policy with an emphasis on health at the University of Michigan. He then worked as a senior policy analyst on HIV prevention for the Washington, D.C.-based Association of State and Territorial Health Officials, a group that represents state health officials throughout the U.S. There he coordinated projects between the CDC and state health officials and learned about the CDC’s mission. The agency protects the U.S. from domestic and foreign health, safety and security threats, and fit with Flaherty’s interest in public health. In 1998, he got a job at the CDC and his first overseas assignment as a health prevention specialist. He went to rural India as part of a team of international health providers working to eradicate polio through vaccinations. As he went from one small village to the next talking about vaccination, he experienced two of the most common obstacles to public health officials working to stop the spread of disease — fear and stigma. “Some people, especially religious minorities, feared we were there to sterilize them,” he said. After many conversations to educate local leaders about polio and vaccination, the medical team Flaherty worked with was able to get people to agree to vaccination and eradicate polio. There have been no new reported cases since 2011. “A key part of disease prevention is social mobilization and community engagement with local leaders so that people can learn to care for themselves,” he said. After India, Flaherty worked on public health in Louisiana and then moved to the CDC’s headquarters in Atlanta. He worked on agency budgeting, policy, and planning and strategic financial management while also earning his master’s in business at Emory University. Itching to get back overseas, Flaherty jumped at the chance to work in Beijing in 2008. He became part of a global disease detection team just in time to work on the swine flu pandemic. The outbreak began in Mexico in April 2009 and quickly spread to 74 countries. By June 2009, the WHO had declared the H1N1 flu a global pandemic. The CDC worked with health care officials, providers and companies, and a vaccine was developed to end the outbreak. Ultimately, between April 2009 and April 2010, 60 million people in the U.S. contracted H1N1 and 12,469 died — most of them children, according to the CDC. In September 2012, Flaherty took his current job in Bangkok, running HIV/STD prevention research clinics. In his spare time, Flaherty traveled throughout Asia and relaxed with his beloved English bulldog, Porkchop. Then, in early September 2014, Flaherty opened an unexpected email. The note, from a senior CDC official at the agency’s Center for Global Health, said the CDC was marshalling its forces to deploy as many people as it could to fight the Ebola outbreak. Would he be available? 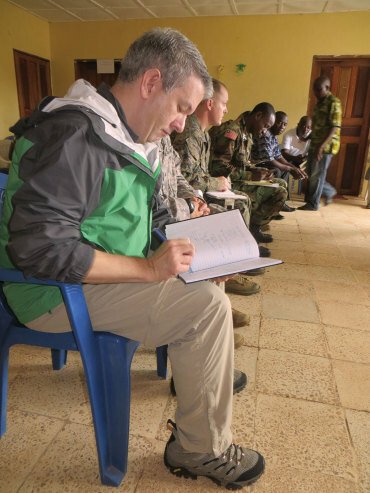 Patrick Flaherty ’92 records observations during a meeting with health officials in Margibi County, Liberia to select a site for an Ebola Treatment Unit (ETU). The Armed Forces of Liberia will lead the construction of several ETUs in Liberia. He called his parents and sister to tell them the news he was going to Liberia. All were supportive. 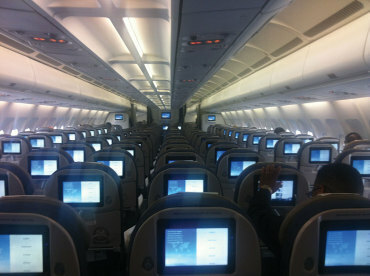 In less than a week, Flaherty was on the empty plane to Liberia. When he arrived and walked down the steps of the plane, Flaherty was immediately asked to wash his hands. At the entry to the airport, there was a barrel with a protruding spout. Water mixed with a heavy concentration of Ebola-killing chlorine poured over his hands. Chlorinated water barrels were at the entry of every public building in the Liberian capital. On the way to his hotel, the Mamba Point, Flaherty talked with his driver, a Liberian who worked for the U.S. Embassy. “We talked about the Ebola awareness campaign that was running on the radio and about how people were anxious but starting to understand the situation,” he recalled. Ebola was previously a disease concentrated in the Democratic Republic of Congo and had never struck in West Africa before the 2014 epidemic. Many Liberians didn’t think the virus was real and resisted help. Some thought health care workers were entering villages to infect people with Ebola, or that people were getting sick from poison or malaria. Most didn’t understand the disease spread through bodily fluids and that bodies of the recently deceased were the most contagious. The disease spread because people touched family members as they were sick and died. Then they came in contact with others, who got sick. The government launched a public awareness campaign about Ebola’s danger. Signs saying “Ebola is real” were posted in public places and the government commissioned a song with three well-known Liberian singers to communicate ways for people to protect themselves. “My driver thought the song was working,” he said. When Flaherty arrived at his hotel, he learned that a dead body had been picked up off a street nearby that day. “People knew by then not to touch dead bodies, so [bodies] would remain [on the street] until a specially trained burial team could get to them,” he said. Flaherty then began a daily routine. At 8 a.m. each day, he attended a meeting at the U.S. Embassy as part of the Disaster Assistance Response Team (DART) that had been deployed by the U.S. Agency for International Development (USAID) in August. Meetings included staff from USAID and the CDC. The team assessed priorities and identified needed resources, such as personal protective equipment and generators. At 9 a.m., Flaherty rode in a car to Liberia’s Ministry of Health and Social Welfare to discuss the government’s social mobilization and community response efforts to stem the outbreak. Then he would return to his temporary office at the U.S. Embassy or the Emergency Operations Center and review proposals from nonprofits and other organizations that were offering help. At 5 p.m., he’d join a conference call between the DART team in Liberia and DART teams in Sierra Leone and Guinea, USAID in Washington and the CDC’s Ebola emergency response center in Atlanta. At 6:30 p.m., the CDC’s 30-member team in Liberia would talk or meet. Three times a week, the CDC team met with the Liberian Incident Management System, which was coordinating work between charity groups and the Liberian government. Those meetings included personnel from the CDC, Doctors Without Borders, USAID, the United Nations, the World Bank and the WHO. Once a week, other groups joined the humanitarian discussions. After that, he’d meet again with Liberian government officials to discuss what he’d learned. Often discussions continued well past dinner. Flaherty ate in his hotel most of the time he was in Liberia. Flaherty monitored what each group was doing on spreadsheets, sharpening the organizational effort to stop the outbreak. He’d prepare written reports for the Liberian government, USAID and the CDC on all the simultaneous activities to make sure they adhered to an effective strategy. Twice, he left Monrovia for rural Liberia. He traveled with the Liberian military and U.S. military officials to visit an Ebola treatment center in the Suakoko district, run by the Los Angeles charity International Medical Corps, and talked with local officials about the roads and latest developments in the outbreak. While he didn’t speak directly to patients, Flaherty watched health care workers get on their moon suits and listened to them talk about what they needed. 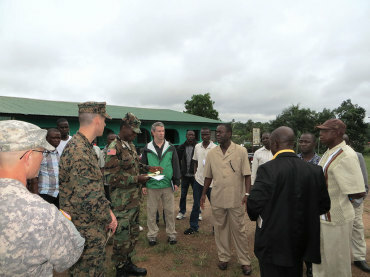 The group then visited several locations where another treatment center, supported by the U.S. military, was to be built. Flaherty also made a visit to the town of Harbel, the location of Firestone Tire and Rubber Co.’s 185-acre rubber plantation. The plantation, which employs 80,000 people, had successfully fought the outbreak by building its own Ebola treatment center and deploying community religious leaders and teachers to talk with people about quarantines and getting treatment when sick. Between August and the end of September, there were 71 confirmed Ebola victims and 53 deaths, but as of early October, only three patients remained at the treatment center. No new cases had been reported. “What Firestone did shows you just how important the social and community aspects are to stopping an outbreak,” Flaherty said. When he returned to the U.S. in mid-October, Flaherty spent six weeks traveling around the country visiting friends and family, part of an already scheduled leave that all CDC employees are authorized to take every two years when they are posted overseas. Though he never had contact with anyone with Ebola, Flaherty took his temperature twice a day for 21 days after leaving Liberia. The maximum incubation period for Ebola is 21 days and if someone doesn’t show any signs of illness after that period, they are considered Ebola-free.